Tobacco flavoured E Liquids have always been the best option for those who are transferring to vaping from smoking. Steam age has hand-picked a fine selection of tobacco flavoured E Juices to help you on your way. Choose from our range of High PG, High VG & nic salts blends, that include: mild tobacco, strong tobacco, subtle tobacco, sweet tobacco, ultra-smooth tobacco, unfiltered tobacco, sun-cured tobacco, Turkish tobacco & light cigar flavoured e liquids. If in doubt, try the #1 best selling tobacco eliquid in the world - Halo’s 'Tribeca' - an exquisite, smooth, tobacco blend with notes of caramel and just a touch of vanilla. Whichever you choose today, please enjoy the experience and congratulate yourself on trying something new or sticking with something that works for you. Tobacco E Liquids There are 20 products. Two Cousins Tabac E Liquid An intoxicating blend of the world's finest tobacco flavours. Tobacco E Liquid, Made in NZ. Ol' Smokey by Vapeboss (30ml/ 65ml E Liquid) Ol' Smokey is that perfect mix of rich pipe tobacco with a woody spice hit of sweetness, subtle and soothing, perfect for a cold winters night by the fire. American Patriots by Naked 100 Tobacco American Patriot by Naked 100 Tobacco takes you on a ride with a classic tobacco cut, featuring a full-bodied rich tobacco blend with firm, full rounded, and distinct notes that pay homage to the most legendary of tobacco flavours. NKD 100 Salt American Patriots Tobacco Classic American Tobacco Flavour - Served SALTY The new NKD 100 Salt Nicotine line up now available express shipped NZ & Australia. Tobacco by Mr. Salt-E E Juice Bold Tobacco nic-salts juice. Use with low-wattage vaping pod systems. 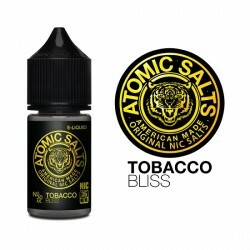 Tobacco Bliss | Atomic Salts Mild Sweet Tobacco You just inhaled a little bit of heaven. Tobacco Bliss satisfies your appetite for a mild, sweet tobacco taste without the guilt. Use only with vaping pod systems. 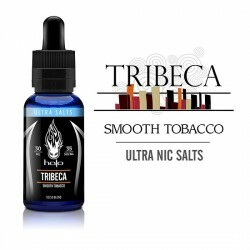 Halo Ultra Salts | Tribeca Ultra-Smooth Tobacco Nic Salts The industry standard tobacco flavoured e liquid, now available in a superb nic salt version, with the same smooth flavour. Providing you faster nicotine delivery, longer-lasting nicotine effect, and more discreet vaping. Use only with low-wattage vaping pod systems. Halo Tribeca E Liquid Ultra-Smooth Tobacco Your favourite tobacco e liquid is now available in the new 50ml & 100ml bottle formats. Smooth and mild yet distinctly tobacco with just a hint of caramel. Stringent quality control with every bottle. Halo Turkish Tobacco Smooth Light Tobacco Halo's Turkish Tobacco E-liquid blend offers an excellent combination of sun-cured tobacco flavour with a very light semi-sweet top note. Halo Turkish Tobacco Type V - High VG Blend (70%) Smooth Light Tobacco Turkish Tobacco E-liquid has a relatively mild tobacco flavour, so it is a great choice for “light tobacco” smokers still seeking substantial throat hit and good vapor production. 70% VG blend, optimised for sub-ohm vaping. Halo Prime 15 E-liquid Bold Nutty Tobacco A premium tobacco blend e-liquid offering the complex nuances of an authentic cigarette experience. Halo Torque56 Unfiltered Tobacco A premium e-liquid with unfiltered tobacco flavour and serious throat hit. Halo LongHorn E-Liquid Corojo and Cavendish tobacco A rich fire-cured tobacco e-liquid blend offering a robust tobacco flavor with exceptional throat hit. Halo Freedom Juice Robust Tobacco Flavour Whether you're on the range, or an urban cowboy, you'll love the mild, yet flavourful taste of Halo's Freedom Juice premium blended tobacco e-liquid. RY4 by Mr. Salt-E E Juice Smooth Tobacco nic-salts juice. Use with low-wattage vaping pod systems. Halo Ultra Salts | Turkish Tobacco Halo's popular Turkish Tobacco flavoured e liquid, now available in a delectable nic salts version. Use only with low-wattage vaping pod systems. 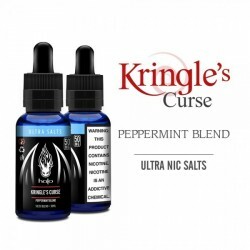 Halo Ultra Salts | Kringle's Curse Halo's fine peppermint flavoured e liquid, now available in a delicious nicotine salts version. Use only with low-wattage vaping pod systems. 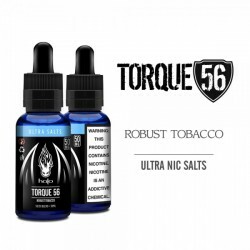 Halo Ultra Salts | Torque56 Halo's classic Torque 56 robust-tobacco flavoured e liquid. Now available in nic salts for that extra nicotine satisfaction in your pod-system. Use only with low-wattage vaping pod systems.